With its inclusion of the fundamentals, systems and applications, this reference provides readers with the basics of micro energy conversion along with expert knowledge on system electronics and real-life microdevices. 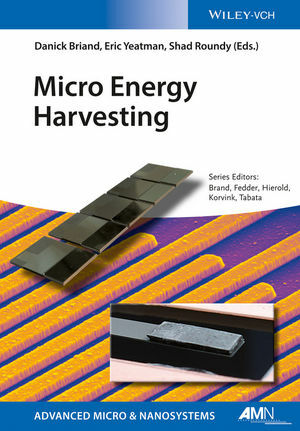 The authors address different aspects of energy harvesting at the micro scale with a focus on miniaturized and microfabricated devices. Along the way they provide an overview of the field by compiling knowledge on the design, materials development, device realization and aspects of system integration, covering emerging technologies, as well as applications in power management, energy storage, medicine and low-power system electronics. In addition, they survey the energy harvesting principles based on chemical, thermal, mechanical, as well as hybrid and nanotechnology approaches. In unparalleled detail this volume presents the complete picture -- and a peek into the future -- of micro-powered microsystems. Danick Briand obtained his PhD degree in the field of micro-chemical systems from the Institute of Microtechnology (IMT), University of Neuchatel, Switzerland, in 2001. He is currently a team leader at EPFL IMT Samlab in the field of EnviroMEMS, Energy and Enviromental MEMS. He has been awarded the Eurosensors Fellowship in 2010. He has been author or co-author on more than 150 papers published in scientific journals and conference proceedings. He is a member of several scientific and technical conference committees in the field of sensors and MEMS, participating also in the organization of workshop and conferences. His research interests in the field of sensors and microsystems include environmental and energy MEMS. Eric M. Yeatman has been a member of academic staff in Imperial College London since 1989, and Professor of Micro-Engineering since 2005. He is Deputy Head of the Department of Electrical and Electronic Engineering, and has published more than 160 papers and patents on optical devices and materials, and micro-electro-mechanical systems. In 2011 he was awarded the Royal Academy of Engineering Silver Medal. He has been principal or co-investigator on more than 20 research projects, and has acted as a design consultant for several international companies. His current research interests are in radio frequency and photonic MEMS devices, energy sources for wireless devices, and sensor networks.